Gary Woodland claimed his first win since 2013 as Shane Lowry bogeyed three of his last six holes to finish near the back of the field in the Waste Management Phoenix Open. The Texan (33) defeated Scottsdale based Kansas native Chez Reavie (35) with a par at the first extra hole after a dramatic finish at TPC Scottsdale. As overnight leader Rickie Fowler fell away, carding a disappointing 73 to finish six shots out of the playoff in a tie for 11th, Woodland (33) made nine birdies in a seven-under 64 to set the clubhouse target at 18-under-par. 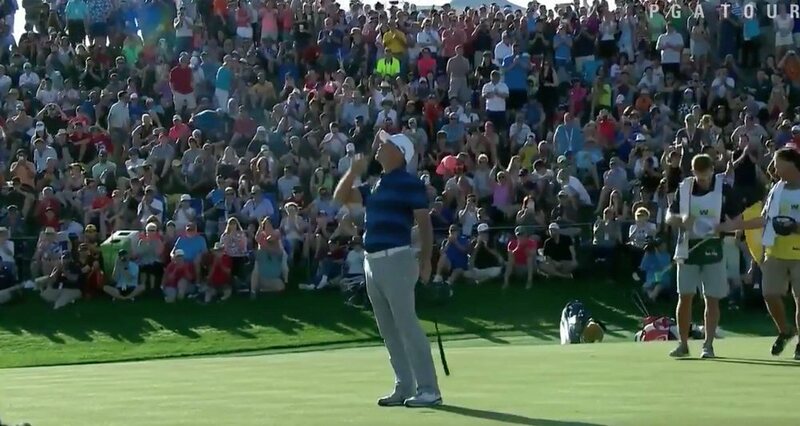 He had to sweat it out on the range awaiting his fate but former Arizona State graduate Reavie made amends for a bogey at the 16th when birdied the 17th from three feet and then rolled in a do-or-die 21 footer at the last for a 66 to force sudden-death. Woodland drove into sand on their return to the 18th but made a safe two-putt par from the front edge as Reavie missed the green from the centre of the fairway and after chipping weakly, failed with an 11 footer to stay alive. It was an emotional win for Woodland, who announced last March that his wife had lost one of the twin babies the couple were expecting. "It's really hard to put in words right now," he said, cradling the surving twin. "I'm, obviously, last year we battled through it, couldn't get to the off season quick enough, couldn't start 2018 soon enough. "For him to be here, it's obviously a miracle, but I'm just so excited to share this with him and my family and hopefully it's the start of something special." If Woodland was beaming, there was little to smile about for world number 67 Lowry, who frittered away shots coming home and signed for a level par 71 to finish tied 65th on two-over par. After slotting home a 15 footer for birdie at the 10th, a 10-footer at the 15th and a 12-footer at the first to move into the red, Lowry stumbled coming home by following a dropped shot at the fourth with three-putt bogeys at the seventh and eighth. Lowry would end the week ranked 71st of 72 for strokes gained putting, missing seven times from in the four to eight feet range. On the European Tour, India's Shubhankar Sharma (21) closed with a stunning, 10-under-par 62 to win the Maybank Championship and storm to the top of the Race to Dubai. Winner of his maiden title at the Joburg Open in December, his bogey-free round left him two shots clear of Spain's Jorge Campillo on 21-under-par at Saujana Golf and Country Club in Kuala Lumpur. “The last two months have changed my life," said Sharma, who became just the third Indian after Jeev Milkha Singh and Anirban Lahiri to win two European Tour events in the same season. "I’ve always dreamt of winning, and now I’m a two-time winner on the Asian Tour and European Tour." Four shots behind overnight, Sharma rattled off four birdies in a row from the fourth to get within two strokes of the lead, then holed a long putt on the ninth to turn in 31 and cut the gap to one. He went on to fire five birdies on the back nine at to claim the €400,930 winner's cheque and a 119,320-point lead over Tommy Fleetwood at the top of the Race to Dubai. Darren Clarke earned €3,578 for 81st place despite missing the secondary cut after a third round 79. Clarke is not in action in this week's European Tour event, the ISPS Handa World Super 6 Perth, where Qualifying School graduate Gavin Moynihan will be the lone Irishman. Lowry moves on to this week's AT&T Pebble Beach Pro-Am where Rory McIlroy will make his debut with a major endorsement from former world number one Greg Norman ringing in his ears. The Australian is convinced that newlywed McIlroy's recent three-month sabbatical will pay off after a winless 2017 and three seasons without a major victory. "It was undoubtedly a shrewd move to take a break," Norman told Omnisport. "He's got the ball-striking capabilities to win a major this year. "I know his Achilles heel has been his putting, it's hard to fix that away from tournament pressure but he definitely he has the ball-striking capabilities to win another major this year." Following top-three finishes in his first two starts of 2018, McIlroy will be seeking his first win for more than 500 days (16 months) when he joins Lowry, Pádraig Harrington, Graeme McDowell, Seamus Power and sponsor’s invitee Paul Dunne in California.